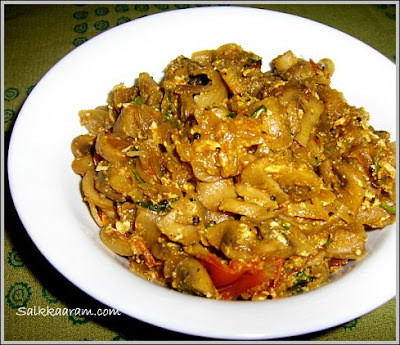 Mushroom with egg | Simple and Delicious ! 2)Splutter 1/2 tsp of mustard seeds. 3)Saute onion in this till golden. 4)Fry garlic and ginger for 2 mins. 5)Add tomato, green chillies, turmeric powder, chilly powder, salt and curry leaves. Stir well. 6)Add mushroom, stir and cook by adding little water. 7)Cook until no water remains. 8)Break two eggs, add into this mixture, stir well and let it dry. Really, all your recipes seem simple and delicious. the uploaded photos of your recipes are soooooo inviting that I feel like trying each and every one them. I've tried your egg curry and it tasted great and looked great tooo. Pls do continue with the good work. I have always struggled to make veg mallu food for my hubby who is a big fan of authentic mallu dishes.Your recipes have been very helpful.Especially the veg recipes.I am yet to try your non veg recipes.I'll try them out soon and let you know how I get on. Very happy to know you liked my veg recipes, hope you will love the nons too, I have done my best to bring out the authentic recipes.. I have tried a few of your recipies.. they are really simple and great.I must say i never realized i liked cooking until had to start cooking a few months ago.